Wow! These are some angry girls! After spending fourteen bucks and listening to this CD, you are going to be angry too. 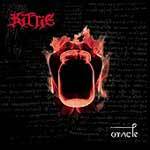 Kittie (now a trio) released their latest effort, Oracle, in mid November, but they probably should have left this one on the shelf. I am sure that it is hard to come up with another Spit, but come on, at least try. Morgan, Talena and Mercedes can play, no doubt about it, but it seems like this one was thrown together. The track “Pink Lemonade” is 10:37 long. If you are going to put a song that long on a CD at least play! It sounds like somebody plugged in a guitar, then hit the record button and gave a live microphone to someone and told them to ramble into it. You can tell they were just filling time. The Pink Floyd cover, “Run Like Hell” was OK. It was like listening to a lounge act perform it. The CD starts to resurrect itself towards the end. The song “Safe” is good. Slow but good. “No Name” comes on and you know that it is pit time, will be great live. Sorry girls, better luck next time. You still need to see them live, they do great.